It begins with Charleston, South Carolina, one of the world's finest cities. 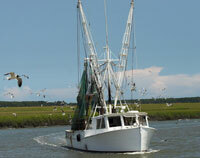 Charleston's ocean waters provide some of the best seafood available anywhere in the world. From succulent, tender shrimp to world-class tuna, mahi-mahi, grouper, red snapper, flounder and much more. Unlike many online seafood companies, we process, package, and ship our seafood all from the same location - our company headquarters in Charleston, South Carolina. This gives us the unique ability to carefully monitor the quality through all the steps needed to fill your order. Your seafood never leaves our quality control system until it is shipped to you. But that's just half the story. A critical part of the equation is getting the fish from "hook to table." Quality is our primary concern. Charleston Seafood has the most technologically advanced processing plant known anywhere. We exceed the Food and Drug Administrations HACCP plan guidelines, concentrating on precise temperature control throughout the distribution process. Our top-quality shellfish is regulated by the Department of Health and Environmental Control. These are just a few reasons why Charleston Seafood has the finest seafood available anywhere. After your first order, we think you'll agree. Our only goal is to bring you the finest seafood available -- fresh and to your table. Thank you for your patronage.